I have to tell you that MINT has never been on my radar until now. I don't know why and all of a sudden, I don't care why....because I am in love with it. 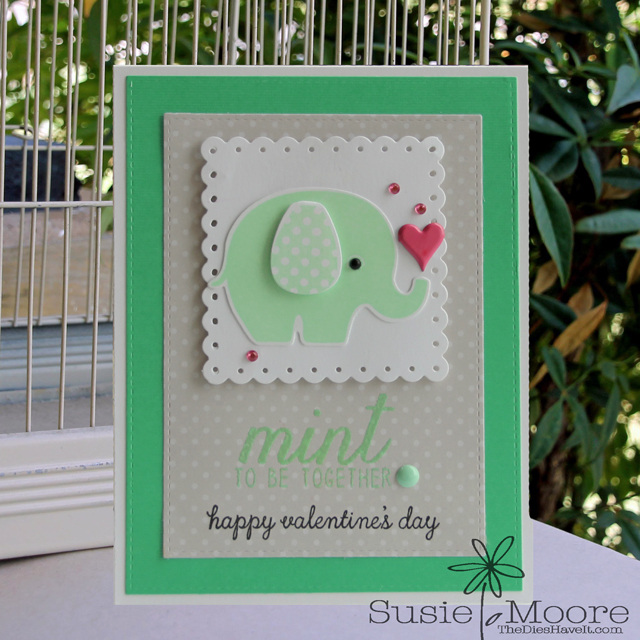 This little elephant stamp and die set from Clearly Besotted just screamed MINT to me and then I found this great sentiment from Reverse Confetti. Not to mention that I own an Avery Elle mint pigment ink pad. I wanted to add some pink....so out came the heart brad and some fun bling from Eyelet Outlet. I hope you like my experiment into mint. You will be seeing more!